MineKraft: Ultra is a mod for Minecraft 1.12.2 that adds traditional online rpg classes for the player to choose from; expanding combat options significantly. We focus on accessibility and action-packed combat, and you won't find a lot of pointless bars to fill or an unending grind to access the cool stuff. The largest inspirations for the combat and class design are Hexen, Everquest 1, and the Hero-system from Warcraft 3. New Player Attributes: Mana, Mana Regen, Magic Armor, Magic Damage, Cooldown Reduction, Critical Chance and more. A New JSON-configurable Spawning System Designed to make creating consistent adventure content easier for content developers. Visit Our Website to see a list of the currently implemented classes and their abilities. 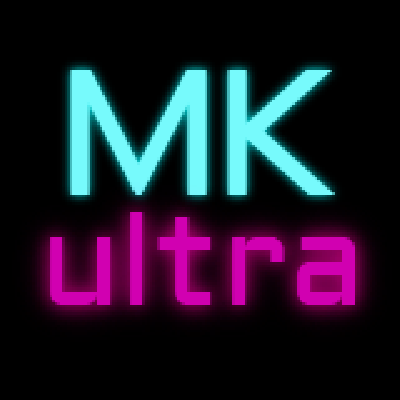 MK: Ultra has only one required mod which was built specifically for MK: Ultra, but made standalone since it could be useful for others. The first thing you must do to start using the MK-Ultra mechanics is unlock your first class. This is accomplished by crafting a class-unlock item. You will be able to unlock all classes in the game and switch between them at will, so don’t worry about this choice to much. The class you choose will determine what abilities you get, how much health and mana you will have, and what armor you can wear. This will allow you to unlock the first class: The Green Knight. The Green Knight will give you a balanced mix of offensive and defensive abilities and can wear the heaviest of armors. After you have learned your first class, you can now open the Class Panel, the default hotkey for it is ‘J’. The screen will list the abilities your class can learn and has some additional stat information. You should have 1 ability point to spend, you can put it in either of the first 2 abilities. Other abilities will unlock as you level up. Click the plus button to level up an ability, or the minus button to reclaim a spent point for reallocation, or to re-order your abilities on your hotbar. In order to level up you need to construct an XP Table. Each level will cost you progressively more XP. With level 2 costing 2 xp levels, and level 10 costing 10 xp levels. You will gain an ability point for every level. The maximum level is 10. When you die, you will lose 1 class level and your last spent ability point will be removed. You cannot lose a level or ability point if you are level 1. When you eat the forgetfulness bread you will lose your current class and return to your original classless state. The level of your class will remain and when you swap back you resume where you left. 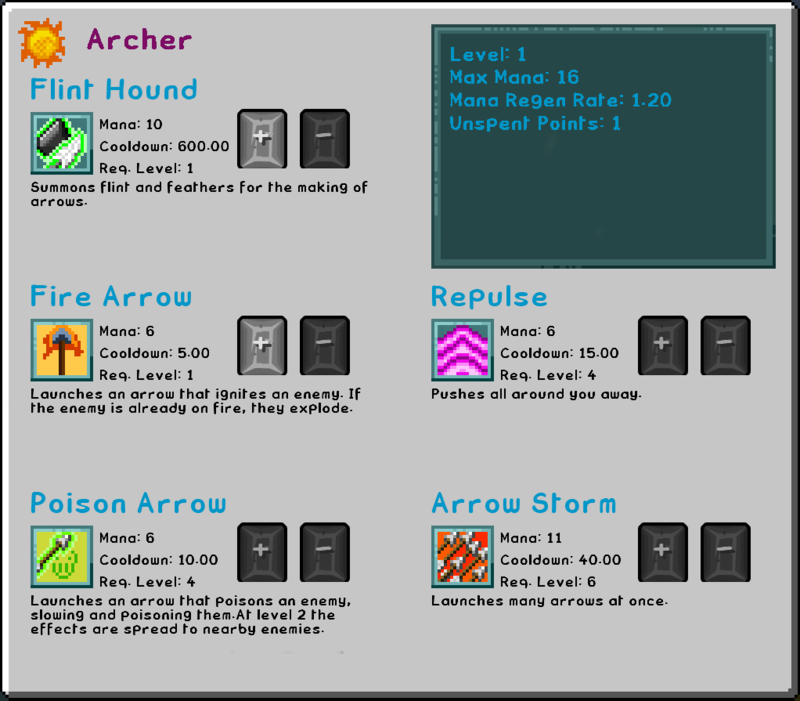 This menu will show all classes you have previously unlocked and let you choose between them. The Class Panel is where you see your stats/learn abilities. It defaults to ‘J’. The ability hotkeys are bound by default to ALT-1, through ALT-5. You might want to rebind to 1-5 as you will be using the abilities in combat often. Visit the wiki to learn more about configuring spawners, or if you just want to see what the data looks like visit our MKSpawnConfig repo to get you started. Set /sponge config -g entity-activation-range.mods.mkultra.enabled false in order to ensure that all spells function correctly. Hey there. I've recently installed this mod on my multiplayer modded server and the party system doesn't seem to work. The players get the pop-up, but party doesn't get created when they choose "yes" option. Are there any incompatibilities with other mods? There are not any incompatibilities that I am aware of but I have heard this as well. The party system really just is some simpler commands for using the built in minecraft teams feature. So if you have a mod that does anything to the team system that might impact it. I am not aware of any such mod myself, but there are a lot of mods I am not aware of. I have heard reports of this as well and would love to get to the bottom of it, if you could stop by our discord channel or post an issue on github (whichever you are more comfortable with) it would be a better place to address the problem. A list of the mods you are using and a full log from the server would be helpful. I really want to do sound effects and better animations in the future. At the moment these kind of visual/audio things are on the back burner, but eventually we will get there. Audio in particular also takes a ton of labor to produce the fx. Maybe someone will come along that wants to help with this part. I also have dreams of writing a new more interesting particle fx system so that we can have even cooler spell animations. The npcs did get casting animations in this update so you can tell when they are casting. Alright :) Thanks for reply! Does this mod work in multiplayer? I want to play with one friend. Everything does work in multiplayer. Make sure to invite each other to a party to get the full effects of playing together when it comes to the class system. Type /party invite [friends name] and they should see a yes/no dialogue on their screen. When you are close to each other you will be able to see each others health bars and many beneficial effects will now be shared. Is this mod getting updated or is it dead ? There are some major systems in development, but nearing a new release. 2. the ability for heals to affect passive/neutral/friendly mobs... everyone wants to be able to heal their trusty mounts and pets! 3. Multi-classing. Even if there was a level cost to unlock it... I reallllllly want to be able to pick abilities from unlocked classes to mash together. Also, suggesting maybe changing Druid to elemental mage/knight since lightning and fire balls really seem less druidy than magey. Personally I'd love having a druid ability like... "call to the wild" or something, where it causes any surrounding neutral/friendly mobs to attack the thing attacking you or does so via the spirits of animals... Green knight feels way more druid than druid abilities, but that might just be me. Trying out this mod, and forgive me if this info is available somewhere, but I couldn't find it on your site or wiki, but how does one target something? I took the healing ability for green knight and I have been unable to target any entity with it, from another player to a passive animal. Any time I use it it heals only me. From the text about the ability's use of the word "target" I would think I'd be able to target something on purpose to heal. Is this the case? The other player needs to be on your team. You can type /party invite [playername] in order to form a team with another player without the wonky minecraft commands. For another entity like a passive animal you would have to use the minecraft built in team commands. Thanks!! Figured out the party thing. Very cool. Really enjoying it. I'll look into the mc team thing too. Thanks again! Have some problems with configuration. Can't switch off armor restrictions on server. # If enabled, shield restrictions won't take effect. # If enabled you won't lose levels on death. # If enabled armor restrictions won't take effect. Make sure both the client and the server have the same config files. Are you using the minecraft gui to edit configs or setting them in the file? setting them in the file. Also, thx for help, it worked. Super great mod, this is easily my favorite one! I was curious if there are plans to add any configs for server owners/modpack makers to customize some of the cooldowns and damage settings? Overall it's pretty great for modded MC but I've not really seen mana or most cooldowns be much of a problem or consideration for any class. Also do you plan to change any of the notifications/text in the mod? I play on a server with friends and everyone has been very confused by "brouzoufs" and the xp table. None of that's a very big deal but thought I'd ask! I've also noticed only a single problematic bug in my hours of playing the mod. Seems that armor materials added to the config are still not entirely recognized by the mod. They'll display the appropriate armor class on the tooltip but if you try to put them on while playing a class that should be able to wear them, they'll just be taken off immediately. If you you shift click them on, they'll stay but then duplicate the armor. Pretty strange! Anyway, as I said I really love the mod, just thought I'd leave some thoughts! Thanks for all your work! Thank you very much for the compliments! Sometime in the future we might look at making abilities more configurable, but I think it would be after we have achieved many of our other goals first. We strive to get the balance right to start with so that it is fun out of the box with no configuration, and most values are extensively play-tested. 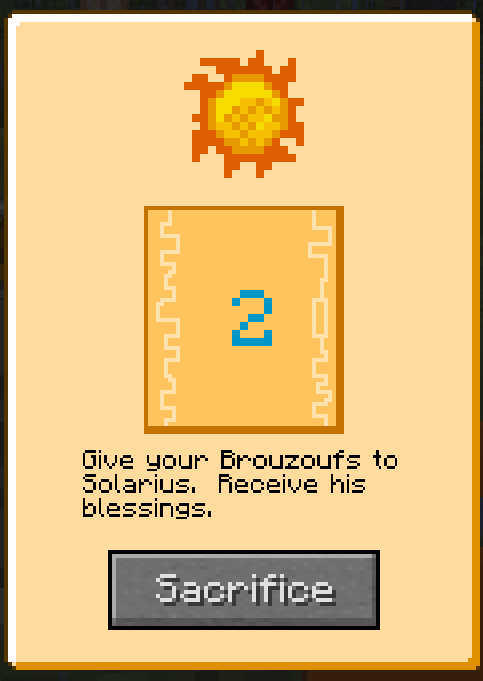 Brouzoufs is an inside joke/reference to another game that has probably out-lived its longevity. I'll look into rephrasing these things. I'll look into the armor material problem. Thanks for reporting it! This looks like an amazing mod.